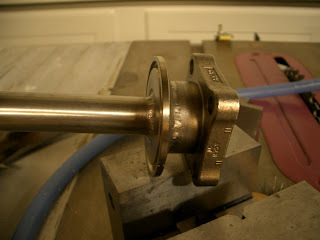 I just finished welding together the stainles racking cane for the beer fermenter project. Even though this may not look like much, I am quite proud. It is a 5/8" dia stainless tube, but the wall thickness is only .020". I sliced it on my new metal band saw, reoriented the pieces to make an elbow, then tacked it in two places, and welded all the way around. It's air-tight. The trick is to get the tacks done really quickly. I only used filler (.035") to make the tacks, then just fusion welded it in very short sections (a few seconds at a time). I blew through it once, and had to repair it with filler. 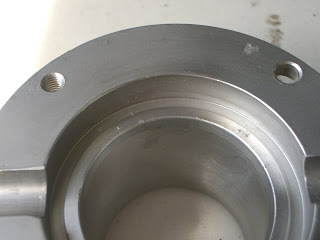 Here's the tube welded to a tri-clamp plate, which is welded to one side of a three-piece ball valve. Here's the other side of the ball valve welded to a hose barb. The complete assembly is attached to the tri-clamp port on the side of the tank. The purpose of all this hardware is to be able to rotate the racking cane while draining beer from the tank. Thus, the height at which the beer is drawn can be adjusted. This allows the maximum amount of clear beer to be drawn from the tank without getting any cloudy beer that has settled to the bottom. 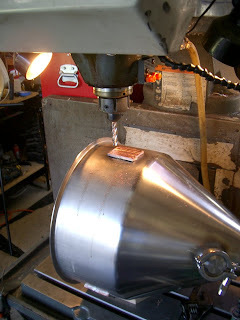 The next step in the beer fermenter project is to mount some copper blocks to the outside of the stainless tank. 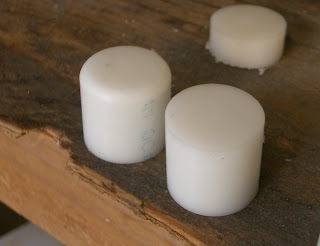 The purpose of these blocks will be to thermally couple two peltier devices to the surface of the tank. The tank is cylindrical (near the top) and the peltiers are flat, so the copper blocks must be curved on one face, and flat on the other. 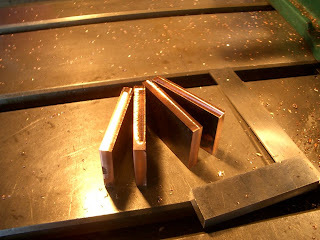 I started by cutting off some chunks of copper and milling the edges square. A monster crack had developed in the wall of the tank! I am still not sure why this happened. It obviously has something to do with the metals' differing rates of expansion, but I had no idea the consequences could be so damaging. 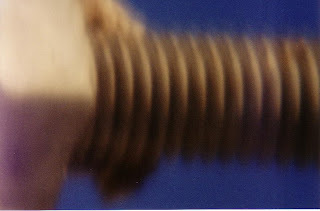 Perhaps this has something to do with the stresses in the metal from the spinning (cone-forming) operation? 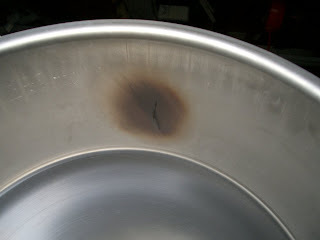 Luckily it wasn't too difficult to repair the crack. 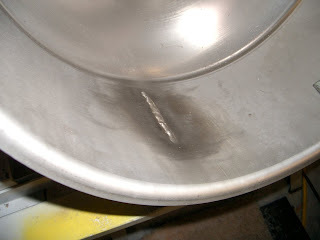 Since the crack went clear through the tank wall, I had to fight the silver solder which was molten and trying to flow into the weld puddle. The copper blocks must be making good thermal contact, since I maxed my TIG machine out at 200A, and it was just enough to comfortably weld. 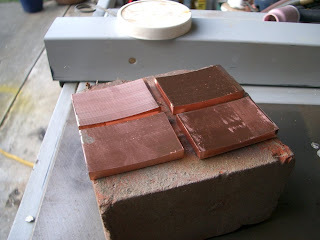 There are two copper blocks (each made of two pieces of bar). 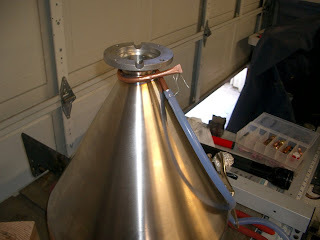 In order to avoid the silver-soldering nightmare again, I used silver epoxy to join the copper to the tank. 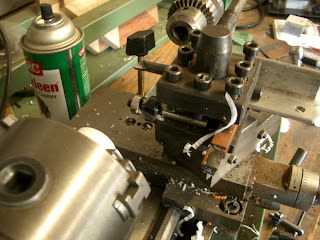 After both blocks were attached, I mounted the assembly in the milling machine, and flattened the faces. If I were going to do this again, I would profile the copper backside, flatten the face, then use silver epoxy to attach it to the tank. UPDATE: This method did NOT work. I was not able to hold the glass without rocking it very slightly. This created a very smooth, but curved surface on the copper. It was unsuitable to mount the peltier. 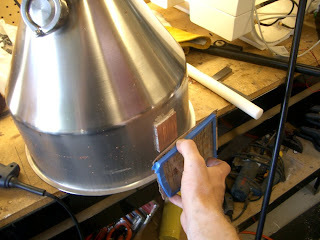 Here, I am removing the milling marks with sandpaper mounted on a 1/4" thick glass plate. This took a very long time. In fact, I am still "going up through the grits" right now. The next step will be to weld a small threaded boss on either side of the copper blocks. This will serve as an attachment point for the peltier heatsink. The peltier itself will be pinched between the copper and the heatsink. 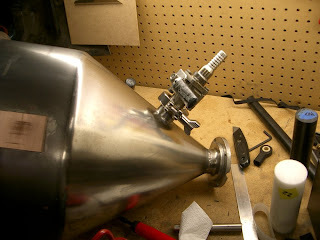 Please search my blog for "fermenter" to find all of the posts regarding this project. 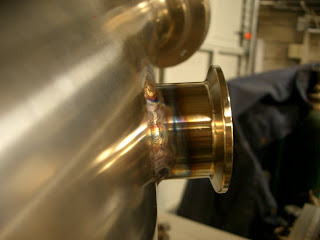 I am building a stainless steel tank that will eventually become a very unique beer-brewing vessel. My idea is to make a tank such that the entire process can take place without ever having to transfer the beer from one tank to another. 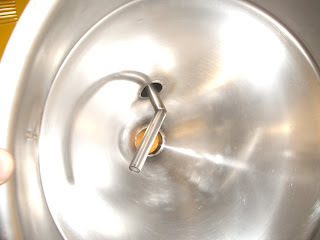 This vessel will boil the wort, chill the wort, provide a temperature-controlled fermentation period, allow the trub to be removed, and provide a secondary fermentation. This tank was designed with my experience in brewing about 30 5-gallon batches of beer using the extract process. 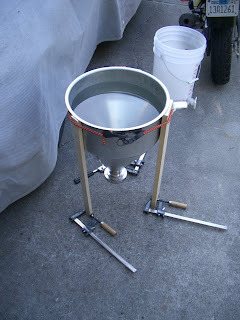 I don't have much inspiration to do all-grain brewing yet. 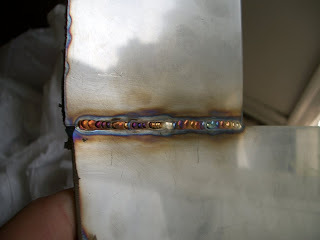 Having said all of that, I am also learning to TIG weld, and this project will provide many different welding setups -- all in stainless steel. 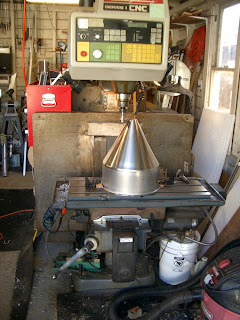 Toledo Metal Spinning sent the item very quickly, and I am impressed with the quality. The edges are extremely flat, and the overall finish and dimensional tolerances are great. 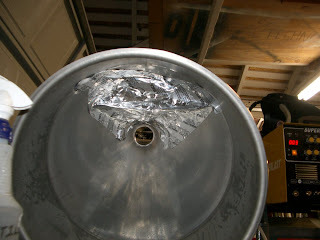 It holds 6.4 gallons total, so a 5 gallon batch of beer should fit pretty well. 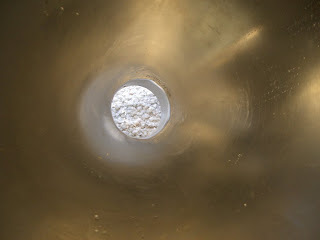 The hopper is a continuous piece with no hole in the bottom. 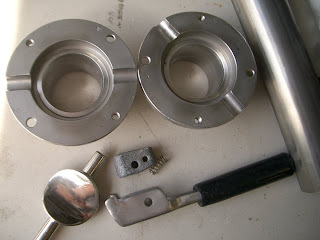 I will be mounting a butterfly valve at the apex, so I need to cut the tip off to match the diameter of the valve housing. I knew before I ordered the hopper that I would only need to slice off about 1/8" off the end. I used a slitting saw in my milling machine to do the job. This left me with a super flat clean edge. 70 RPM, 0.5 inches per minute, however the feed rate is measured at center of the saw, and I programmed a G2 circular path. This means the feed at the cutting point is probably lower. I had problems with chatter, thus necessitating this low feed rate. 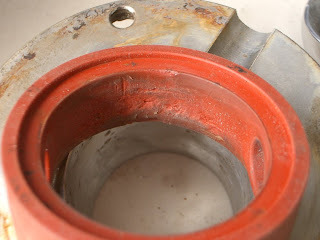 This is one half of the butterfly valve housing after I welded it to the cone. 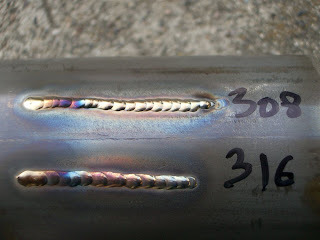 The blue hose is silicone, and is carrying argon to the backside of the weld. 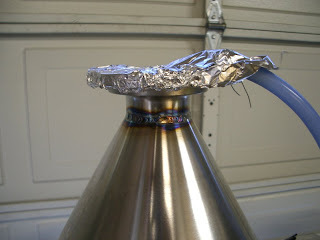 In addition to the foil on top, I have made a dam with aluminum foil and tape inside the neck of the cone to trap the argon in the space around the weld. 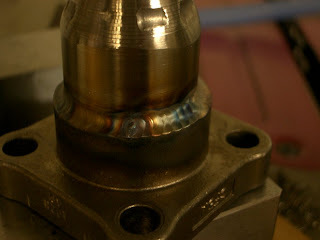 Since the first weld went so well, I decided to weld on the inside of the fitting as well. 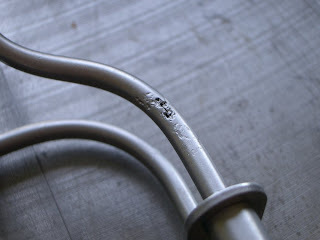 Ultimately, this was not a great idea, but the weld itself went well. 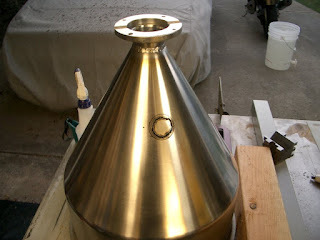 I used a copper tube with a line of tiny holes drilled in it to disperse backing argon to the outside of the cone. 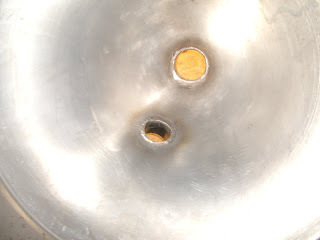 I had a fair bit of room inside the valve fitting for the TIG torch and filler rod. I used a die grinder to smooth out the interior weld. After putting it together, it leaked! 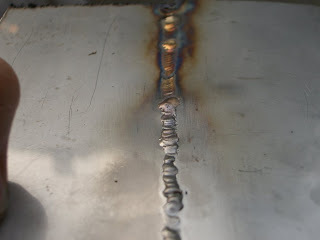 I had used the die grinder too much, and made the metal thin enough where a tiny pinhole in the weld made it all the way through the metal. I re-welded the outside bead, and then realized that I should have just made a couple of passes on the exterior to build up material. 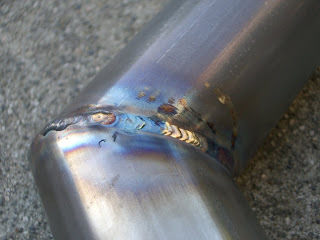 Then I could die-grind away the inside until I ground into the weld bead. No need to weld the interior. This would provide a nice smooth surface inside the tank and ensure there was enough material to keep it structurally sound. 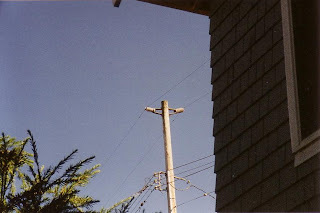 I originally started to cut this hole with a high-quality hole-saw in a corded drill. After a few seconds, I realized it was probably not going to work. 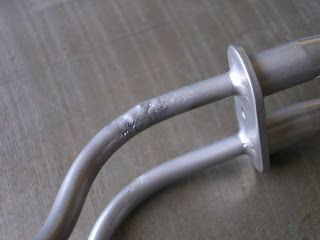 Stainless is just such a tough metal, cutting tools just bounce off it. I used a free-hand plasma cutter to make the hole. I made another aluminum foil/tape dam around the wall on the interior. 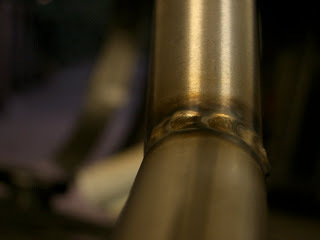 The weld went pretty well. This time, I learned how to do it. Instead of welding on the inside, I just built up a nice bead, then used the die-grinder on the interior until I ground into the bead. It's nice and smooth on the inside. I decided to sandblast the part so that I could see how extensive the damage was. Yeow! 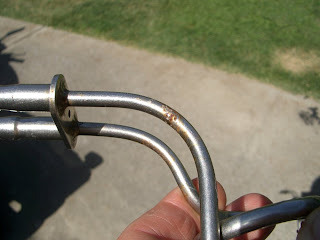 The metal must have been exceptionally thin, and the sandblasting blew right through it! 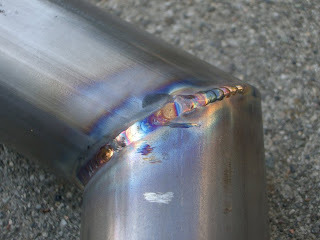 I used 316 SS filler rod, and TIG welded the hole shut. 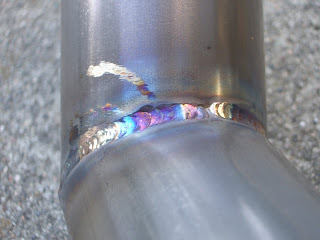 The blue tube is an argon hose to protect the inside of the stainless tube from oxidation while welding. I mixed a %15-by-weight solution of citric acid in water. I got 2lbs of citric acid on eBay for under $10 shipped. 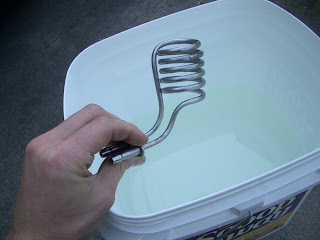 I submerged the stainless coil in the solution for 2 hours at room temperature. 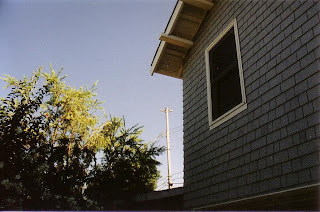 I could see the surface changed a bit -- the shade of gray was a little different. Hopefully this means it built up a nice strong oxide layer. 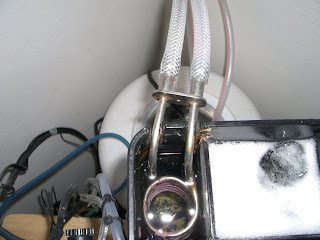 I've put the coil back into the aquarium, and added some silicone pads to the filter box so that the plastic would not scrape away at the stainless coil. I'll keep you updated to see how effective it is. 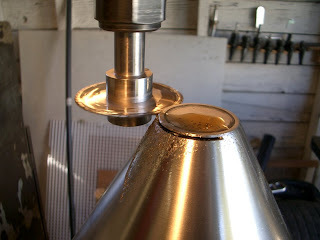 I use a round-over router bit in my lathe toolpost to leave an attractive, uniform edge on the part. 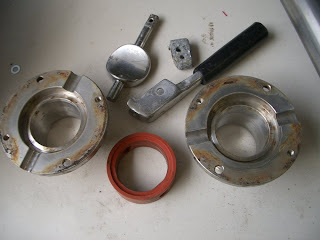 I mostly work with plastic, so the tooling angles are not as critical as for metal. 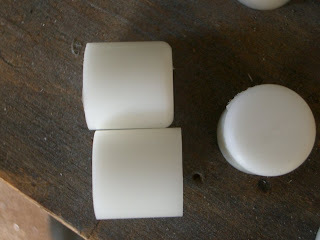 Here are two 1" long 1" dia sections of white Delrin. The upper piece has its right edge rounded over by the 1/8" radius router bit. I am preparing to build a beer-brewing tank that will be temperature controlled. The goal is to keep the vessel at a very steady 72*F. Depending on the time of year, this might require heating and/or cooling 24 hours per day, or heating during the night and cooling during the day. Since the only heat load on the vessel is the heat leakage through its insulation, the total amount of heat that needs to be pumped is fairly low. This might be a good application for a Peltier heat pump since the heat load is low and the heat pump direction might need to be changed often. As I mentioned in my aquarium chiller post, the Peltier module must not be controlled by PWM (pulse width modulation) or on/off thermostatic control. 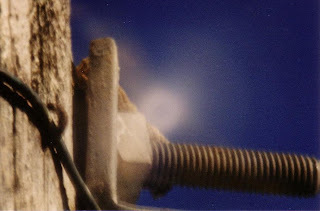 During the 'off' part of the cycle, heat will flow backward through the Peltier device and decrease efficiency almost to zero. Ideally, the PWM output should be smoothed with an L-C (inductor-capacitor) circuit to provide clean DC power to the device. I happened to disassemble a thermoelectric refrigerator (and replaced its guts with a refrigerant-based system in a previous post) and had a 115VAC Peltier power supply and Peltier module. The power supply uses a TL494 IC to control a 115V->12V high-frequency transformer. 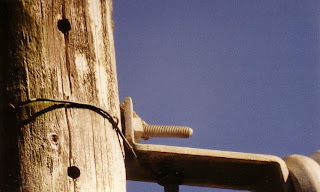 The output of the transformer is smoothed with an L-C circuit. The TL494 is controlled by the output of a thermistor and digital thermostat, thus sending more power into the transformer when the fridge's temperature exceeds the thermostat set-point, and reducing power when the temperature falls below the set-point. I couldn't figure out the analog side of the circuit which had a few op-amps. Instead, I discovered that I could throttle the power supply by putting voltage on the TL494's DTC (dead-time control) pin, which wasn't used in the original circuit. Cool. So now I have an efficient power supply that I can throttle from 0V to 12.5V (full power) to the Peltier. Next, I need a thermostat to control the power supply and also reverse the polarity of the Peltier device (to switch from heating to cooling). I thought about using an Arduino to do the whole thing: sense the temperature, provide a UI with LCD and buttons, process the PID loop, and send output to the power supply. My biggest worry was the UI. There are actually a lot of parameters in a PID loop, and I didn't feel like writing code to make all of them user-selectable. 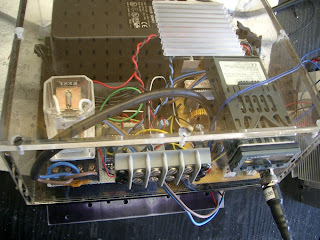 I also had another Eurotherm 2132 PID controller (same as the aquarium project) which I really like. 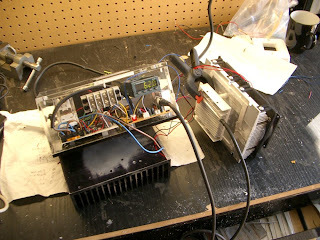 I decided to use the Eurotherm and build a circuit to convert its output into a control signal for the power supply. The Eurotherm has two outputs, a relay and a driver output for an external solid-state relay. 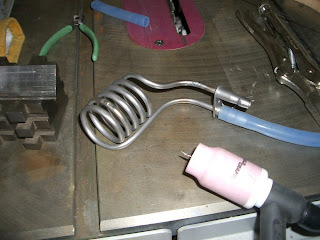 I removed its internal relay and directed the relay's coil wire connections to the Eurotherm's rear terminals. I then used an optoisolator to interface the Eurotherm's floating outputs to the rest of my signal-converter circuit. The Eurotherm can be configured so that its output 'cycle' for each output is 1 second. Thus, it essentially outputs a PWM signal at 1Hz for cooling, and another 1Hz PWM signal for heating. I wrote a little code for an Atmel AVR ATMega8 that reads the two control signals from the Eurotherm and outputs a voltage that controls the Peltier power supply. It does this by generating high-frequency PWM and smoothing it with a simple R-C low-pass filter. The current draw is very low. The AVR also controls an NPN transistor that drives a DPDT relay. The relay will reverse the polarity of the Peltier device. All of the above-mentioned circuitry is crammed into an acrylic box that I made for this project (left). The Peltier module has a small heatsink and a large heatsink with two fans (right). I modified the power supply (by removing a fuse, and adding a fan), and tested it with two Peltier devices hooked in parallel. It seemed fine at 12.5V and 7A. 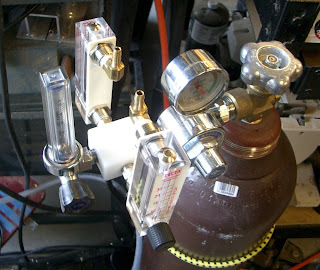 The next step is to mount the Peltier devices onto the brew tank and test it out. The tank will hold 5 gallons. For thermodynamic analysis, I will assume it's water. So, that's about 20 liters, and water has a specific heat of 4.2J/g*C, so the tank will require 4.2(20)(1000)=84KJ to change 1*C. If the Peltiers are consuming 12.5(7)=88W, and are 50% efficient, they will be pumping about 44W (in cooling mode), which is 44J/s. In order to change the tank's temperature by 1*C, the system will need 84000/44 = 1900 seconds, or 30 minutes. This is good and bad. The good news is that the tank will remain very stable, as it is not in danger of being quickly influenced by the Peltier. The bad news is that the tank must start out fairly close to the target temperature, or else it will take a long time to be regulated by the system.